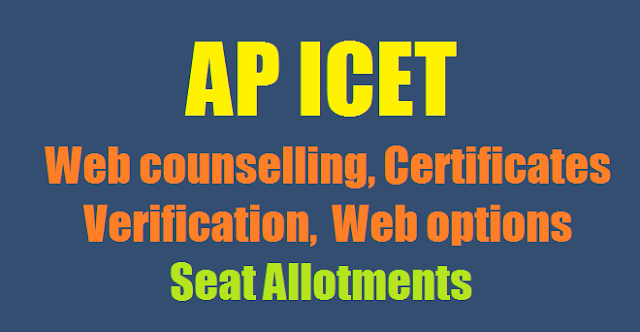 AP ICET 2017 Final Phase Web counselling, seat allotment Result-Certificates verification Dates, Web Options MBA, MCA @apicet.nic.inAPICET - 2017 Final Phase Provisional Allotment List released- Download College-wise Seat Allotment Details @ https://apicet.nic.in/college_allotment.aspx AP ICET Final Phase Counselling Dates 2017, Rank wise Certificates verification dates for OC/BC/SC/Minority and ST Category students ,Web options schedule @apicet.nic.in AP ICET-2017 Certificate Verification Dates for Web Counselling/Web options, Seat allotment results AP ICET 2017 Schedule announced for Certificates verification and Web counselling/web option Entry: AP ICET-2017 Certificate Verification Dates for Web Counselling for APICET 2017 Admissions: The qualified candidates of A.P-ICET-2017 are informed to attend certificate verification in any one of the Help Line Centers (HLCs) as per the schedule given under. The list of Help Line centres, the distribution of Ranks for each Help Line Centre for Certificate Verification, See the Annexure-I for OC/BC/SC/Minority Category Candidates and Annexure-II for ST Category candidates and all other important information is placed on the Website: https://apicet.nic.in/Default.aspx and candidates are informed to visit this website before they go for Certificate Verification. AP ICET 2017 Certificate Verification And Web Counselling, eligibility, certificates to be produced, fee details, counselling dates rank wise, allotment order and all other details refer the detailed notification given below or available on the ap icet 2017 official website https://apicet.nic.in. 2017 as per the ranks mentioned below. 06.08.2017 or 07.08.2017 from any Help Line Center and exercise options. The qualified candidates of AP-ICET-2017 are informed to attend certificate verification in any one of the Help Line Centers (HLCs) as per the schedule given under. The list of Help Line centres, the distribution of Ranks for each Help Line Centre for Certificate Verification, refer Annexure-I for OC/BC/SC/Minority Category Candidates and Annexure-II for ST Category candidates and all other important information is placed on the Website: https://apicet.nic.in and candidates are informed to visit the website before they go for Certificate Verification. The Qualified candidates of AP ICET 2017 for admission into MBA and MCA courses are informed that certificates verification start from 11-07-2017 and Web options entry from 14-07-2017. for more details refer the detailed notification available on website. 1. Official Website Open on 3rd July 2017. 2. ICET Counselling – Document Verification July 11th to 15th, 2017. 3. APICET Web Counselling – Web Options Entry (1st to Last Ranks) 14th July to 17th July 2017. 4. Seat Allotment Results 19th July 2017. 5. ICET Classes Starts from 26th July 2017. 2. Processing fee can be paid by the candidate using credit card or debit card or through net banking from 09.07.2017. (for PH, CAP, NCC, Sports & Games and Anglo Indian) ONLY AT GOVT.POLYTECHNIC, NEAR BENZ CIRCLE, VIJAYAWADA. All ICET-2017 Candidates can exercise their options from any Internet café or Help Line Centre or from their Residence after Certificates Verification on the above mentioned dates. The detailed Procedure of Exercising Options will be placed on the Website:https://apicet.nic.in. All Help line centres will work from 09.00 A.M. to 05.00 P.M on each day. Options will be frozen on 17.07.2017 at 06.00 PM and allotments will be placed in the Website on 19.07.2017 after 6.00 PM. For all other details refer the Website. APICET -2017 Counseling Schedule was released by President Vijaya Raju on Wednesday (June 28). Students' certification Verifications will be conducted from July 11th to 15th. The Web options are from July 14 to 17. The seats are allotted on 19. Classes start from 26th. The complete details can be obtained from the APECET website on the third day of July.